By Sempronius - Retained II by Hanover. Hazel Burke is best known as the dam of the leading money-winner and two-year old champion of 1918, ETERNAL, who went on at three to win the Brooklyn Handicap and place in the Preakness Stakes the year Sir Barton won the Triple Crown. 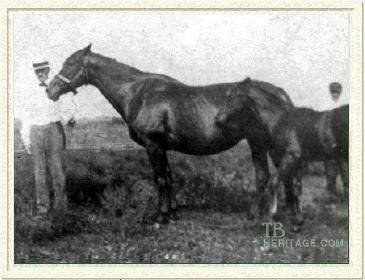 She was a daughter of imported Sempronius (Blinkhoolie-Hamptonia), winner of of Newmarket's Craven Stakes, and Retained II, an 1895 daughter of Hanover and the black mare Reclare (Reform-*Clara-Dutch Skater), the latter part of the vast herd maintained by James Ben Ali Haggin at his Rancho del Paso operation in northern California. Hazel Burke ran four times as a juvenile, unplaced, for her owner, J. Rodegap. At age three she started twenty-one times, and although never a winner, placed second seven times and third twice, all racing in Kentucky, where racing did not stop during the wagering blackout of 1910-11. Her best distance was a mile. Sold to J.B. Gorman, her record did not deter him from crossing her with high-class stallions. Through Eternal, Hazel Burke was ancestress of the important American broodmare, Grey Flight and her foals, including What a Pleasure, Misty Flight, Misty Day and the top racemare and broodmare Misty Morn. In tail-female, Hazel Burke was, through daughter FOREVER (1917, by Ballot), grandam of Belmont Stakes winner Vito (1925, by Negofol). Through daughter CHERRYCOTE (1921, by Broomstick), she was tail-female ancestress of the good runner Rousillon (1981), winner of the Queen Anne Stakes, Sussex Stakes, and other good races in England and France, and of the 1998 Kentucky Broodmare of the Year, In Neon (dam of Sharp Cat, Royal Anthem, and Star Recruit).